Meyer Lemon Chicken Picatta is exquisitely divine and easy to prepare. The light, rich sweetness of the lemon sauce in juxtaposition to the salty capers and deep tones of white sage, make this a perfect Le Voov! ‘comfort meal’ to be shared with friends and family. Serve it with fresh pasta, herb-roasted potatoes or lemon-rice pilaf, accompanied by steamed asparagus, broccoli, brussels sprouts or try our Rainbow Carrots, Haricot Verts & Caramelized Shallots. Heat a skillet to medium to melt the butter, then add the shallots and garlic, stirring until slightly browned (1 – 2 minutes). Set aside. Using the same pan, add remaining olive oil, lemon juice, wine, stock and herbs, cook until reduced by half (8 – 10 minutes). Place lemon rounds on the bottom of a 9 x 14 oven-safe pan. 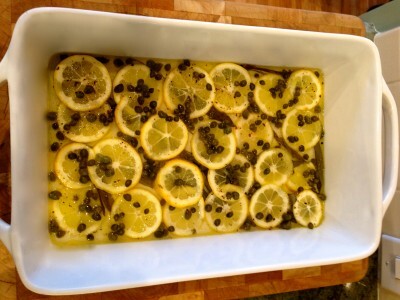 Drizzle with 1 tablespoon of olive oil and half the capers on top of the lemons. Add the chicken breasts to the pan, pouring wine reduction sauce over chicken. Add salt & pepper, then sprinkle garlic, shallots and remaining capers on top of chicken breasts. Bake until a thermometer inserted in thickest portion of chicken registers 165°. 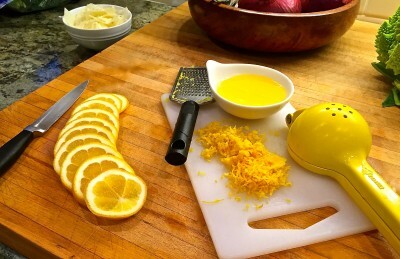 Just before serving, garnish dish with freshly grated lemon zest from one Meyer lemon, and cilantro and/or flat leaf parsley. All information on this site belongs to Erin Sunkel, LLC and copyrighted 2015-2018. Full Rights Reserved. The material presented on Le Voov is original unless specifically noted. You are invited to please contact me if you wish to reproduce any aspect of my work. (Photos, recipes, etc.) I make a tremendous effort to maintain the integrity of my blog and simply ask that you give credit where it is due. Thanks! 🙂 The purpose of this Le Voov blog is purely for sharing educational information, recipes, fun and personal adventures with you. The information included on the site is not a substitute for professional medical advice, examination, diagnosis or treatment and is not meant to treat any disease or medical condition.